2) Predictive discusses the future and makes forecasts about it. It answers the question: What could happen? Insurance companies, for example, use predictive analytics to estimate the life expectancy of potential clients. 3) Prescriptive is all about options and optimization. It wants to chart the best route for your marketing campaigns, by answering the question: What should we do? They are all talking about data but from different angles. 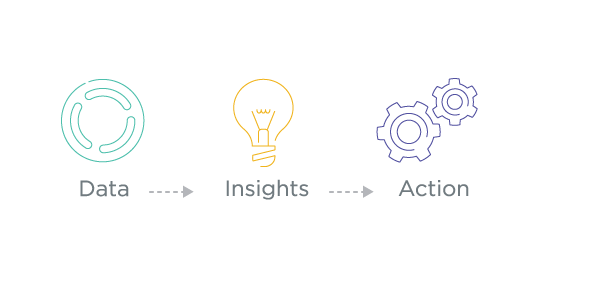 Thanks to systems like cloud servers and CRMs like ProsperWorks, we are now able to capitalize on our understanding of consumers to make better marketing decisions. That is what marketing analytics is all about. Let’s examine the marketing process using AirBnB, a mammoth in the sharing economy space. First, we consider objectives in the context of the 5Cs: (1) company is AirBnB; (2) customers and (3) collaborators are you and I; (4) competitors are mainly hotels; (5) context is the sharing economy. Next we look at strategy in terms of segmentation, segmentation and positioning. Segmentation is dividing a potential market into groups with similar characteristics that will be targeted in a marketing campaign. Using their data, AirBnB can segment groups according to characteristics like location, adventure, price, vacation, family, students etc. Once they’ve selected a group they want to target (e.g. family), they can position themselves to attract this market with a value proposition (e.g. “Home Away From Home”). Remember: strategy is about deciding what not to do. Use prescriptive analytics to guide your decision-making here. What comes after strategy? Tactics. Think of the 4Ps: product, price, place and promotion. AirBnB organizes its content in a way that displays the visuals, descriptions and details of their spaces. Their promotion is mainly in the form of reviews. No marketing process is worth its salt without financials, right? Here you should examine margins, ROI and Customer Lifetime Value (CLV) in closer detail. So how does AirBnB make money? By collecting a percentage from both guests and hosts: guests pay about 6-12% of the reservation subtotal while hosts pay a 3% service fee. AirBnB leverages data on their website to understand the relationship between things like ratings, reviews, number of rentals, property attributes, minimum stay etc. In so doing they can effectively improve rental prospects for hosts and identify better rental options for guests. Text analytics, a process of converting text data into numbers, is one way they can do this. Software like R can convert review text data into review sentiment scores by measuring the good words vs. the bad words. AirBnB takes this review sentiment score and plugs it into a predictive model, like regression, to calculate metrics e.g. Profit Per Property. AirBnB uses data analytics to determine the factors that influences people to rent a property or put it on a saved wish list. They can figure out that review sentiments and cleaning fees are the major factors for guests in Paris, while price and security deposits are more important for guests in Miami. Using these data-driven insights, they realize the need for a regional marketing strategy to support different needs. Do you see how data-driven decisions can impact your marketing? Marketing is both an art and a science. Use data-analytics to challenge your intuitions, justify valuable marketing spend and increase confidence in the boardroom. Don’t just survive. Thrive. Call us on 0743 830 663 and let’s talk about how to leverage data analytics for your business. Our writer, Barbara Jebet, is a content strategist and a brand storyteller. Check out her blog: the slightly curious world of story pot.